Lymphocytes and Macrophages: What They Are and How They Work? This article was helpful. 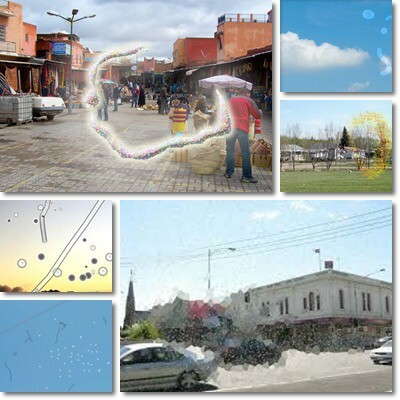 I think I experienced a visual aura/fortification scotoma last evening, with no other symptoms or headache. It was scary since I am 71 and while healthy, have slightly raised blood pressure, early stage glaucoma with micro stent drains and had cataract surgery both eyes a year ago. Sick of EYE STUFF. Thought possibly retinal detachment which my ophthalmologists have had me on alert for many years, not floaters however with last night’s experience. Then I thought TIA. Anyway your article has put me some what into feeling non-emergency and I have put feelers out to my ophthalmology docs to see if they feel like I should be examined more closely. Happy to hear your found useful information about visual aura, Tricia. Hope everything is alright and wishing you lots of health! Well mine are occuring several times a week and the have several blind areas, many oscillating circular zigzags, not just one or two, I also have palinopsia. This has gone on for years getting worse all the time. Two neuros say I have RR MS due to other symptoms, two other neuros question that I do. I eat an organic vegetarian with fish and eggs diet. Sometimes I will have two attacks a day, other times, maybe three a week, or seven times or more a week. I have good health otherwise, good BP etc. I do get tingling and numbness with some of the attacks. They can come on at any time in any weather and even in bed at night. My MRI shows several brain lesions some in the interior cortex. It is debilitating but no doctor has helped. I am sorry to hear about everything you’re going through. I can’t imagine what it feels like to have to deal with all these symptoms and not have a definitive answer for what’s going on, or a solution. It appears the visual aura may be a result of the brain lesions identified on the MRI. The lesions may have promoted the neurologists to consider MS as well. In any case, it can help to also see an eye doctor and just check out your vision, if you haven’t yet. The eye doctor may identify any possible physical problems within the eye and recommend a course of treatment if needed. It’s difficult to say for certain what causes an aura manifestation in the eye, but it helps to try to understand triggering factors or identify associations such as migraines, loud noises, lack of sleep, stress, injury etc. Just as important, it’s always a good idea to monitor visual aura evolution and tackle any issue to prevent potential vision problems later on. Wishing you lots of health! wow . this explanation is exactly what i experienced . the first time about 5 years ago i saw an optometrist right away and was told my symptoms could be an aura . and i had them about 5 times since then and they last approximately 20 minutes . today i had another one . zig zag lines all across my vision field in bright rainbow colours . and fragmented vision when i look at text . and i haven’t felt so good all day . only have a slight headache . i am 72 years old . Hello, Marianne. It’s a good idea to have this checked out by a doctor, especially if the headache continues. Wishing you lots of health! I have been getting auras without followed headache since I was a child, am now 78 yrs old and still get them occasionally. They are annoying but do slowly disappear. My children get them too so am thinking its a genetic thing. Still don’t know why they happen, no rhyme or reason to the episodes. Is there any research on whether they can be passed to children? Hello, Olga. There is such a thing as ‘migraine with auras’. And research shows that migraines with auras seem to be genetic. So this might explain why your children are also getting these symptoms occasionally. If the headaches are too strong, occur too often or there are other symptoms, it might be a good idea to see a doctor just to know everything is okay. You can read more about some of the possible causes of visual auras in the article. 1) Genetics of migraine in the age of genome-wide association studies, by Markus Schürks, published in the J Headache Pain. 2012 Jan.
2) Genetic loading in familial migraine with aura, published in the Journal of Neurology Neurosurgery & Psychiatry 74(8):1128-30, in August 2003. 3) Studies on the Pathophysiology and Genetic Basis of Migraine, by Claudia F Gasparini, Heidi G. Sutherland, and Lyn R Griffiths, published in Curr Genomics. 2013 Aug; 14(5): 300–315. Hope this helps and wishing you lots of health! I have had these small flashing spots and lines every day for 6+ months. Sometimes they are more prominent and sometimes i don’t see any. when im not anxious they don’t interfere with my life but recently ive been very scared of brain tumor. I have no other symptoms. Im 16. Should probably visit the doc. Hi, E. M. It’s a good idea to see a doctor about these flashing spots and lines in vision you’ve been experiencing. All types of changes in one’s field of vision are best investigated by a medical professional. However, seeing spots or flashes doesn’t automatically mean you have a brain tumor, so don’t go thinking the worst. Zigzag lines in vision, hazy or shimmering or wavy lines or other visual disturbances, blind spots and anything even remotely abnormal that interferes with normal vision should always be seen by a doctor, but know they can have the most benign causes. For example, it’s possible for stress or anxiety to cause visual disturbances of the likes, or tired eyes caused by sleep deprivation or too much screen time, rapid eye movements or loud noises. Looking at the sun directly can also be a cause. So see the doctor and try not to worry too much at this point. Wishing you lots of health and hope to hear back from you with good news! My zig-zag patterns start small and then expand outward. Whole episode lasts about a half-hour. Once it’s over, I can go back to whatever I was doing. No headache, pain, or other symptoms. Had this only 2 or 3 times. Dr. said not to worry, that it was silent migraine. At night, when I am reading in bed and tired, the page will show patterns instead of the text. Once I shift my vision is it OK. Does that happen to everyone? Also each eye sees things with a slightly different tint (one more blue and the other more pink). Is that normal? I haven’t experienced the entire range of symptoms associated with visual aura, but I have seen some of the patterns you are describing. Especially when reading at night, like you said. Just like in your case, I would see patterns instead of text in a book or on the computer. Sometimes the patterns look like shimmering zig-zag lines, other times like dark or something of the likes of incandescent red spots or blotches appearing over words. If I stopped reading and closed my eyes even for two minutes or shifted my vision and looked at a wall or a door for a few seconds, they would disappear and I could resume my normal activity. Over time, I’ve come to realize the cause was tired eyes and the visual aura symptoms were amplified by poor lighting in the room. So, yeah, this happened to me too. My doctor told me I shouldn’t worry so long as I didn’t have recurrent headaches or head pain or nose bleeding. But I can’t say I’ve experienced seeing in slightly different colors or tints in each eye. I think this is worth investigating by a doctor. I’d go to an ophthalmologist or optometrist about this particular issue, just to be reassured everything is okay. An eye exam will help determine if the difference in color perceived by one or both of the eyes is a result of a higher intraoccular pressure in one or both of the eyes, potential problems with the optic nerve or maybe a condition like glaucoma or cataract. If your eyes are physically healthy, then it could just be a change in color perception caused by tired eyes or strain on the eyes, sleep deprivation or differences in lighting, going from bright lighting to poor lighting or something to do with a change in your surroundings. 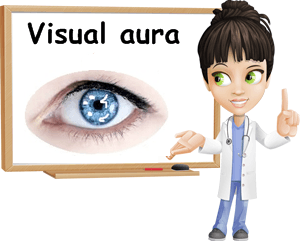 Visual aura symptoms can vary a lot and a whole range of factors can trigger them. Sometimes it’s something as simple as reading in dim light, having tired eyes or being in bright light (think of how bright it is outside when there’s snow everywhere or at noon, during a sunny summer day). Other times it’s extremely loud noises that produce strong vibrations or irritants, pollen or a medical condition. In any case, just have an eye exam and see what the doctor says about seeing in different colors with each eye. Hope this helps and wishing you lots of health!